A lawyer for a south Mississippi school district says a student has been disciplined following allegations that one or more white students put a noose around the neck of a black football player. Sean Courtney, the attorney for the Stone County school district, wrote Tuesday in an email that administrators determined that the school's conduct code was violated in the Oct. 13 incident. He added that a student was disciplined after due process in accordance with district policies. Courtney says he can't name the student or the specific punishment, citing privacy rules. Though sheriff's deputies are investigating, Courtney says there was no indication of a crime in what was reported to staff members. Mississippi NAACP President Derrick Johnson called for a federal hate-crimes investigation Monday as the student's parents stood beside him. Courtney says Johnson's allegations that the district didn't follow its policies are "patently false." WIGGINS, Miss. (AP) - Stone High School's football team was making a name for itself as the Tomcats turned around years of mediocrity with a winning season under the school's first-year coach. But now the south Mississippi school's football program is known for something else - a black junior varsity player who says as many as four white students put a noose around his neck during an Oct. 13 football practice. At a Monday news conference, the Mississippi NAACP demanded a federal hate crime investigation. "No child should be walking down the hall or in a locker room and be accosted with a noose around their neck," state NAACP President Derrick Johnson said during a news conference in Wiggins. "This is 2016, not 1916. This is America. This is a place where children should go to school and feel safe in their environment." Hollis and Stacey Payton, parents of the alleged victim, attended the news conference but didn't speak. Their son, an unnamed sophomore, wasn't present. The NAACP said the incident happened during a break in football practice and that the noose was "yanked backward" while on the student's neck. Johnson wouldn't say whether the noose left marks. State NAACP spokeswoman Ayana Kinnel said the family indicated the student returned to practice after the incident. Stone High has about 800 students, about a quarter of whom are black, according to state figures. The school is the only public high school in the 18,000-resident county. Mississippi has struggled with a history of racial division. It is the last state that still incorporates the Confederate battle emblem in its state flag. In 2014, two out-of-state students at the University of Mississippi placed a noose on the campus' statue of James Meredith, the black student who integrated Ole Miss in 1962. Both pleaded guilty to using a threat of force to intimidate African-American students and employees. Neither attends the school anymore. Names of the students alleged to have assaulted the Paytons' son weren't immediately released. Stone County Sheriff's Capt. Ray Boggs said officials believe something close to what the Paytons described did happen and he's still investigating. He said all the students involved are younger than 17 and he expects any charges would be filed in youth court, where records are closed to the public. "It's probably one of the hardest cases I'll ever handle in my career, because of the nature of it," said Boggs, who is black. "Have I ever had to deal with something like this? No, not from a high school." Johnson said he wants the teenagers charged as adults, as Mississippi law allows in some cases for children older than 13 and younger than 18. Johnson cited federal prosecutions of young people from Rankin County for hate crimes following the 2011 death of a man run down in the parking lot of Jackson motel as an example of what federal involvement could bring. Most of those people were charged as adults. "There is absolutely a role for federal law enforcement," Johnson said. Johnson said someone from the sheriff's department advised Stacey Payton not to file a police report because the father of one of the alleged assailants is a former law enforcement officer. Boggs said he was the one who spoke to Stacey Payton, and that is not what he said. He said he told her that pursuing criminal charges could result in hard feelings among students that could make her son's life more difficult at school, but he did not try to dissuade her. Stone County Superintendent Inita Owen, in a statement to WLOX-TV, said she wouldn't "address a matter of student discipline in the press." "I can assure everyone that the Stone County School District takes all matters involving students very seriously and will do everything within its power to make sure that all policies and procedures were adhered to and that all of its students have a safe place to receive an education," Owen said. Football coach John Feaster, the school's first African American coach, said a player was kicked off the team as soon as school officials determined who was involved. He said he feels "terrible" for the victim, "a tough kid who's hanging in there." "He knows I love him and his teammates love him and the coaching staff loves him and he isn't going to be treated any differently," Feaster told the Sun Herald. "He's one of my favorite kids on this team." Johnson said the Paytons have received no official word about punishments from school officials. He said school district policy calls for immediate expulsion of students who commit assault. 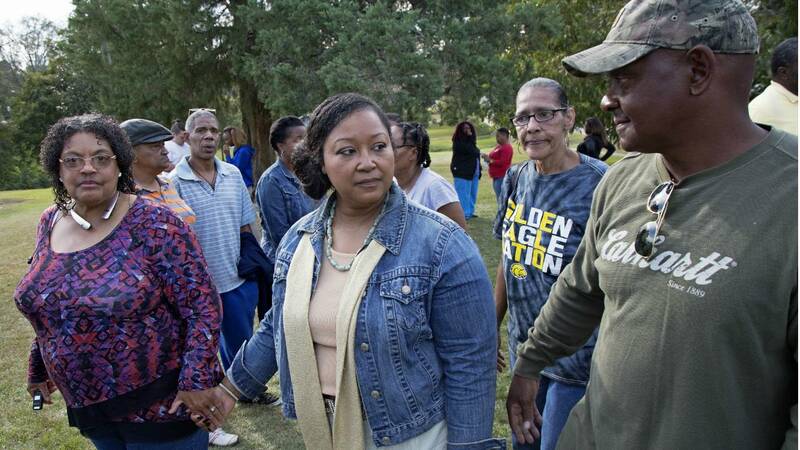 Carissa Bolden of Wiggins, the mother of a middle school student, attended the NAACP news conference Monday and said white students have been flying the Mississippi flag from their vehicles. The upper left corner of the state flag used since 1894 has the Confederate battle emblem - a red field topped by a blue X with 13 white stars. Bolden said she sees a connection between the flag and the noose incident. "I feel like it escalated from them allowing kids to bring Confederate flags" to school, Bolden said. Emily Wagster Pettus reported from Jackson, Mississippi.